Most of us using GIS take advantage of only a fraction of the capabilities, and over time we get comfortable in what we know and do. While this allows us to improve our work and optimize our processes, it also limits our impact across the organization. But expanding the scope of your GIS is a lot of work. At least it used to be. Enter ArcGIS Solutions. Now you don’t need to dedicate significant resources and learn new areas from the ground up. We are committed to providing you easy to use apps, maps, and platform configurations to base your work on. Over the last several years here at Esri we have been working on building more and more of these ready-to-use solutions for you across the entire ArcGIS platform. We currently provide about 200 such industry-specific solutions to help you expand your scope. 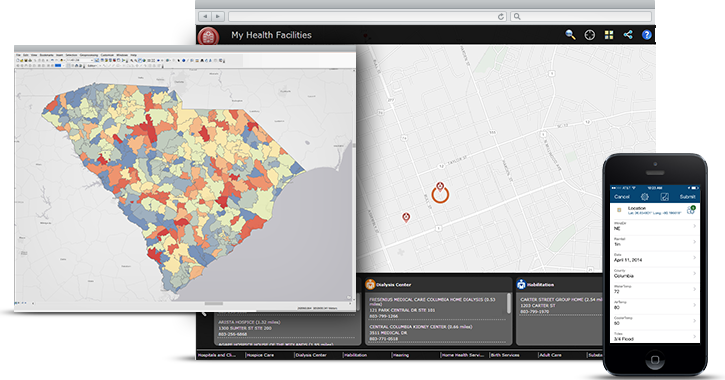 These range from web applications such as Park and Recreation Finder, to configurations of existing apps like Damage Assessment using Collector for ArcGIS, to widgets such as the ArcGIS GeoEvent Processor Extension for doing Water Main Break Notification, and ArcGIS Desktop maps like the Fire Station Run Book. We even provide common information models to provide ideas on how to better leverage the information you already have. These apps, maps, and platform configurations span across the entire ArcGIS platform. For example we deliver additional tools for the desktop, configured mobile applications, ready-to-use web applications, and configured organizational accounts showing best practices for groups, items, and users for your organization. Within the team we understand that some of these solutions may be outside of your traditional comfort zone, so our focus is to make them something you can simply configure and use–no programming is required. Our goal is to help you become a bigger ‘super hero’ within your organization. And we know you need us to stand behind these solutions, so they are all fully supported and maintained. For those of you who are developers, everything we produce is also available on GitHub for you to take and modify the source code. How do you find out more? solutions.arcgis.com is the main site for our solutions and it has links to the apps, maps, and platform configurations, as well as to help, discussion forums, and our blog posts discussing what we are working on. We even have many of the apps hosted on a ‘try-it-now” server for you to try the apps before configuring your own. So go ahead and give them a test drive. You may just find an app or two that will help unlock the full potential of GIS across your organization.